The West Virginia Mountaineers men’s basketball team is in a serious slump. Who better to talk to them than “The Logo” Jerry West? 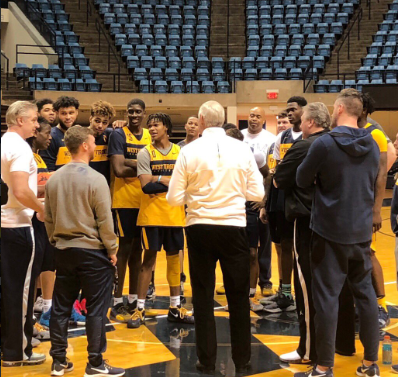 After today’s practice Mr. Jerry West spoke with the Mountaineers. The 1958-59 team will be honored Saturday on the 60th anniversary of their trip to the national championship. The Mountaineers lost in the 1959 championship game to California by a final score of 71-70. A loss that still haunts West. West picked up his fourth foul with 15 minutes to go in the game. Despite playing the last 15 minutes with four falls, West had 28 points and 11 rebounds. In a losing effort he was named the tournament’s most outstanding player. That meant nothing to West. “I felt like we let the state down and all the people that supported us,” said West, a native of Chelyan, W.Va.
An interesting side note of that tournament. Oscar Robertson took the Cincinnati Bearcats to the semifinals. As you could imagine, West and Robertson were the two best players in the tournament by far and everyone expected a showdown in the finals. Instead, Cal took down Oscar Robertson and Cincinnati and followed that up by defeating the Jerry West-led Mountaineers. West and Robertson became co-captains of the 1960 U.S. Olympic team. While becoming two of the best players in NBA history, the two formed an intense NBA rivalry. Despite this, they never met in college. West Virginia still holds a special place in West’s heart. Though the national semifinals were not called Final Four at the time, West Virginia did not make it back until 2010 when Bob Huggins and Da’Sean Butler led them to the Final Four. The 1958-1959 team will be honored at halftime of the West Virginia-Oklahoma game that tips off on Saturday at noon.